This mesmerizing performance piece from Bot & Dolly blends reality and a technological fantasy world. Using 3D projection mapping, two large white surfaces and two talented robots, the artistic duo created a kind of dance that incorporates high technology and a helping human hand. 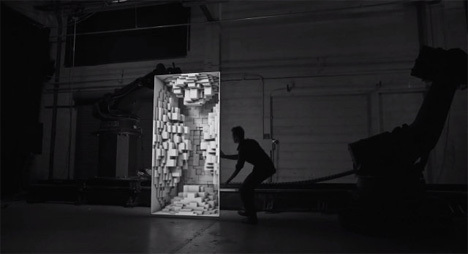 The piece is called simply “Box,” and it shows how current technology can be used to manipulate our perceptions of space. The projections create mind-bending optical illusions that look so amazingly real it’s hard to believe there has been no digital trickery involved. As the making-of video above shows, however, it wasn’t trickery. It was simply amazing technology applied to a graceful and artistic purpose.